The Recipe File is used to relieve items from inventory when those items are components of a POS saleable item such as a dinner entrée. It also can be used to control liquor and other items issued in milliliters or portions. It is also useful for selling case or box items that may be sold by the case/box or by the individual. Examples include 6-pack beverages and 4-pack golf balls, which may be sold by the pack or by the single. From the Food and Beverage/Retail menu, go to Inventory Control then Recipe File. The SET UP RECIPE window will open. Enter the POS Store from which the recipe will be issued (sold). Enter the POS item code or type ? to look up the item. "Description" will populate the POS item description. "Units/Batch, Descr" will populate later, if "Units" is selected in the setup. This will be discussed later. "POS Cost" will autopopulate if entered into the POS item setup. "Sale Price" will autopopulate if entered in the inventory item setup. 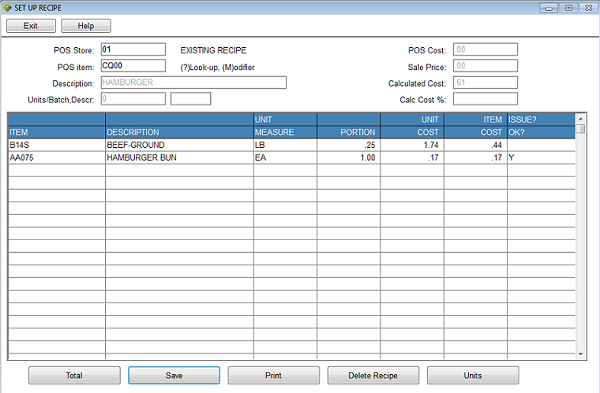 "Calculated Cost" will populate when you click "Total" or when the recipe is saved. "Calculated Cost %" will autopopulate. After you enter the POS item your cursor will go to the setup grid. This is where you enter the components of the recipe with the portions of each. It's up to you whether you wish to include every ingredient or just the primary ingredients. You also can use sub-recipes for sauces, etc., if you wish. Most restaurants include only primary ingredients and then manually issue smaller or subsidiary ingredients such as lettuce or salt as they are used. You also can set up modifiers here. For example, if you have a sauce that is a modifier for one or more items, you can set up the modifier components and they will be relieved from inventory as the items they are modifying are sold. Do not use your mouse to move from field to field. You should press Enter to move from field to field. ITEM Enter the inventory item code or type ? to look it up. DESCRIPTION This will autopopulate from the item selected. UNIT MEASURE The unit of measure will autopopulate from the item's setup. PORTION Enter the portion of the unit of measure that displayed. For example, if LB displays as the UNIT OF MEASURE and this recipe uses 1/2 lb, then you would enter .5 in this field. UNIT COST This will autopopulate. ITEM COST This will autopopulate. ISSUE? / OK? Press Enter to save this item in the recipe. Your cursor will move to the next line. If you do not press Enter in this field, you will not save this line. If you do not want this recipe issued from POS, enter N in this field and then press Enter. The default is Y and you do not need to type Y. This means that, by default, this item will be released from inventory when the POS item is sold. (After POS end of day has been run and after the inventory batch has been updated.) If you answer N in this field, then when the item is sold in POS, nothing will happen in inventory for this line item. 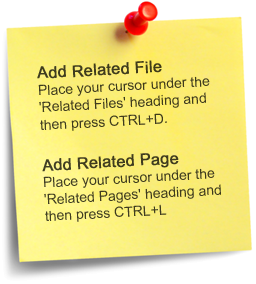 After your cursor moves to the next line, continue as described above, making sure to press Enter after each field and especially in the "ISSUE?/OK?" field. Note: If you go back into an existing recipe and make any change, you must press Enter through every field in the line you are changing; otherwise your change will not be saved. You will notice that the line turns gray when you are editing. It will turn black after it is saved. Below is a recipe for CHICKEN SOUP. Below is the item detail display for CHICKEN WHOLE, a component of the CHICKEN SOUP recipe shown above. Note that the "Qty on hand" shows the issue quantity which is each (EA). The "Average Cost", etc., show the purchase quantity which is a case (CS). For batch recipes, such as pots of soup you can enter the number of units for this recipe. For example, if the pot contains 10 soup cups, you can enter that information. This is informational only and has nothing to do with issue or relieving of inventory. To do this, click "Units". Enter the number of units per batch of this recipe. Enter the description such as SOUP for soup cup. Here is a printed recipe. To set up a modifier, enter M in the "POS item" field, as shown below. Then enter the ingredients (items) for that modifier. There may be only one ingredient; for example, a side such as potato. The example below shows a sauce with two ingredients. Below is what happened in inventory when a steak (POS item) with sauce (modifier) was sold. Note that the steak was relieved from inventory as well as the two components of the sauce.